Dee Whildin's search is on. She's looking for the perfect weed. And the ever-so-lucky one she picks will make history as the 2011 Claymont Christmas Weed. Whildin coordinates the Claymont Christmas Parade -- mark your calendar for 10 a.m. Dec. 3 -- an event that owes its very existence to The Christmas Weed. 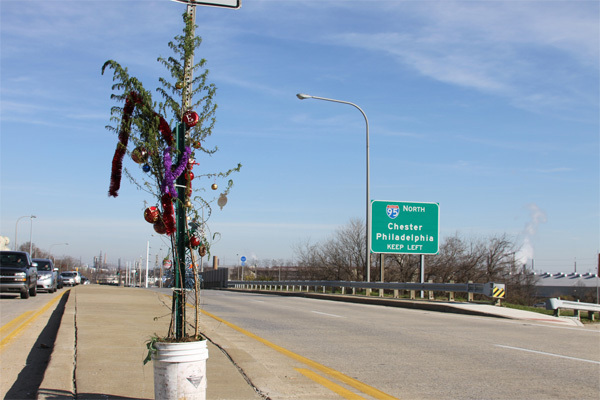 'Twas 1993 in Claymont, a weed sprouted from concrete, and residents decorated it with ornaments, tinsel and love. A road crew cut it. Someone replaced it. Thieves took that one. Another decorated weed appeared. Thieves hit again. Again, it was replaced. Then The News Journal editor hired around-the-clock security. That weed stayed. Claymont celebrated. And each year, a new weed appeared. "That's what started our parade," Whildin said. The idea grew from a Green Day Committee meeting in 1997, former Claymonter Ray Hester said in email. Members talked about an existing parade, the idea of having one in Claymont and, while too late that year, Hester suggested tying it to the Christmas Weed. The first parade was in 1998, setting the tradition of it being the first Saturday in December. Management of Claymont Steel now works with Whildin every year to donate the weed. "We like to go with the goldenrod," she said. "That's what the original one was. They have such a nice shape ... all the branches." Each year, a neighborhood or group does the honor of hosting the weed -- this time, Radnor Green -- and it is the icon of the parade, this year with media personality Rick Jensen as master of ceremonies. Parade participants gather at Maple Lane Elementary School, step off at 10 a.m., go up Philadelphia Pike and end on the lawn of the Church of the Ascension. That church and the Church of the Atonement, a bit down the pike, open to the public for refreshments after the parade, held rain, shine or snow, but canceled just once because of icy conditions. "We even have a song now," Whildin said. "It's 'The Claymont Christmas Weed,' by Andrew McGhie, who lives off Darley Road. ... The Claymont Chorus sings it at the end of the parade." Paraders and spectators are asked to bring canned goods to donate at the Church of the Ascension to help feed the needy. Sign-up is ongoing for the parade, a gentle 1.4 miles, Whildin said, and all kinds of organizations are welcome, as are vintage and antique cars. The parade also attracts elected officials and candidates. "We're loaded up with 'em," she said. "The election is coming." Those in the parade always toss candy, so kids added their bit of tradition. "They bring pillowcases for all the candy," Whildin said with a laugh. "It's like Halloween."